Though many parents may hesitate at the prospect of travelling to Ecuador with children, there are a few reasons why it might just be the ideal family destination. Regardless of their age, you’ll find wonderful places to visit and activities that will entertain and satisfy all family members. From a young age, my parents dragged me around the world and while I barely remember the places we visited, I know that these travelling experiences as a child formed me. At the time, they made me see and understand the world differently. Today, when I see young travelling parents struggling to calm their baby while wandering through Quito’s Old Town or applying repellent to a resistant toddler, there’s a part of me that wonders, “whyyyy?!”. But recalling how important travel has been in my life, that initial feeling quickly turns into admiration for those adventurous parents. The ideal destinations for travelling with children in Ecuador are those that offer the amenities and activities to keep everyone comfortable, entertained and stress-free. Parents with more experience travelling internationally with children, or families with slightly older children, may decide on a more adventurous route. I’ve included a few of these options at the end of this section. Though definitely on the high end of the price range, Mashpi caters to many demographics, including families. Mashpi Lodge is a luxury lodge and research station in the Ecuadorian Chocó only a few hours from Quito. Its infrastructure is impressive, and includes a skywalk, many guided trails and a butterfly pavillion. You just can’t go wrong! Visiting the Galapagos Islands is a once in a lifetime experience for which your kids will one day thank you. Where else can you wander among ancient tortoises (that like to mate in public, by the way) and mounds of Galapagos Marine Iguanas, or snorkel among flamboyant sea lions? Also, since Galapagos Island tours can be reliably reserved far in advance, you can sleep soundly prior to your trip; all the details and logistics will be addressed, which means much less worry and hassle for the parents in charge. Another wonderful family destination is the high altitude, historic city of Cuenca. Here, parents and children alike can enjoy the mild climate, good food, and relatively stress-free exploration of the historic center and the city’s various museums (some more suitable for children than others). Only 45 minutes away, you can access Cajas National Park, a gem in the Ecuadorian Andes and an outdoor playground for nature lovers. In Cajas, you can take the family out on a day hike and return back to the comfort of your hotel in the evening. Don’t forget your camera and raincoat, this place is astounding and tends to be quite wet. As promised, many of you might be into more adventurous travel options that include outdoor activities. 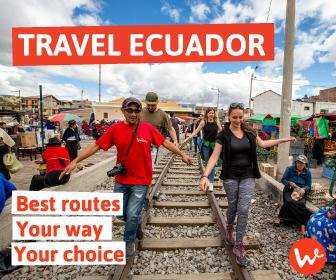 Among these are Baños, Ecuador’s outdoor adventure capital, Quilotoa crater for day hikes and the Quilotoa loop, and the Amazon, to spot wildlife and experience Amazonian indigenous culture. Again, the activities you choose will depend greatly on your children’s age and interests, not to mention your budget, but here are a few fun activities to do if you’re travelling to Ecuador with kids. A popular family activity among Ecuadorians, Molinuco Ecological Reserve offers access to hikes along well-marked trails that lead to a couple of impressive waterfalls. The park is only an hour and a half from Quito and the easiest way to get there might be to hire a taxi for the day (inquire at your hotel). This is a nearby activity that will tire the kids out and also give you a glimpse of the highland forests in the area. Probably the top destination in Ecuador, Otavalo is famous for its handicrafts produced by indigenous people of the area. The Saturday Market on the Plaza de los Ponchos can get pretty hectic, but is an exciting experience and everyone will find something to take home, be it a poncho, an obsidian stone, cheap sweatpants, or a lovely $15 felt hat. Another nearby destination, Mindo is a quaint town in the cloud forest a 2 hour drive from Quito. Over the last few decades, it has become popular among travellers due to the humid, but relatively cool air, outdoor activities and varied food options. If your kids are into ziplining, they can try that here, and a few hostels offer access to well-marked trails through the forest where you can spot wildlife. There are also a number of decent cafes and restaurants, many of which have vegetarian and vegan options. In Quito, families can combine their exploration of the Old Town with a stop through Parque Itchimbia, located on a hill overlooking the city. On the weekends, many local families visit this, and other parks, to play with the kids, exercise and walk their dogs. It’s also a great way to depart from the hubbub of Quito. Afterwards, consider visiting Cafe Mosaico for a bite to eat and for a great view of the city, which is especially beautiful during sunset. Located in Tumbaco, a countryside suburb of Quito, Casa de Rafa offers an excellent weekend brunch and is a lovely place to get away with the kids. There is a playground and green area that parents can observe while brunching on the deck, and afterwards you might consider going on a hike up Ilaló, the ancient (and dormant) volcano upon which Casa de Rafa is built. To get here, consider taking an Uber since regular taxis might try to charge more than normal. Casa de Rafa is about 40 minutes from Quito. One of the main reasons parents decide against travelling internationally with their children is due to the potential risks involved. As a parent, just imagining an emergency is stressful enough. Parents need to know what to prepare for in advance and, in the case of an emergency, how to react. In the following, we’ve listed some essential safety advice for travelling with children in Ecuador. Travel insurance – Before you travel, consider obtaining travel insurance for each family member, family plans are often available at discounted rates. The advantage of having travel insurance is that you can approach a specialist or go directly to a private Ecuadorian clinic, which usually implies better attention. Though the main purpose would be to cover medical expenses, many travel insurance packages also cover loss and theft. Know you hospitals – Before you travel, you can inquire with your embassy in Ecuador about which hospitals or doctors they recommend in each major city. Hopefully you’ll never have to refer to this list, but it doesn’t hurt to come prepared. street food, generally. It might have been sitting in the sun for a while and sanitary practices are often nonexistent. To be on the safe side, carry hand sanitizer and/or wet wipes with you at all times, wash your hands and those of your children regularly and always drink filtered water. UV radiation – Take UV radiation in Ecuador seriously. It easily causes sunstroke, first and even second degree burns. Ecuadorians avoid time in the sun between 11am and 3pm, use sunglasses, hats and long sleeved shirts and you should too. Apply sunscreen to all members of your family every day, you won’t regret it! Carry a travel-sized first aid kit – You never know when you’ll need to disinfect a small wound. Get yourself a complete travel-sized first aid kit to hold the basics, including a pain reliever, ibuprofen or acetaminophen (for fevers), antihistamines and cold medicine. If your children require more specific medication or medical equipment, make sure to bring this along since you might not be able to find the same brands in Ecuador. Safety on the streets – Especially in busier areas of a large city like Quito, it’s easy to lose track of those little ones. Make sure you keep an eye on them at all times and have a plan/meeting point in case you get separated. Only parents – If you’re travelling alone with your children, regardless of whether or not you’re married, you might be asked for proof of consent from your child’s other parent. 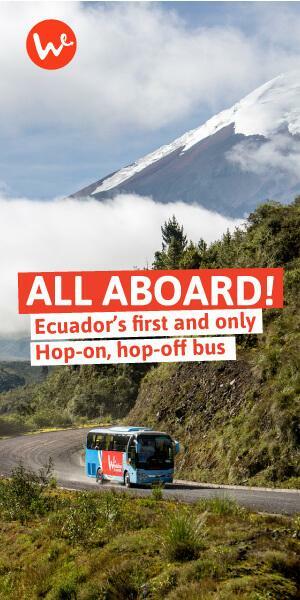 This can be especially problematic when departing Ecuador so make sure you get written consent JUST IN CASE. Though international travel may seem intimidating to undertake with the kids, a little bit of planning and a can-do attitude can take you a long way! Ecuador is a very do-able destination if you’re travelling with children, especially for the nature loving families among you. It offers many beautiful places to visit a vast selection of fun activities for each member of the family.